Smoking or vaping cannabis appeals to people for a wide variety of reasons. Whether it’s for medical or recreational use, most regular consumers develop a list of favorite strains. The effects of these strains are not always the most appealing thing about them. The various terpenes present in varying amounts in all cannabis flowers makes many of them distinctive and memorable. Among the most appealing strains are those that have enticing fruit flavors. 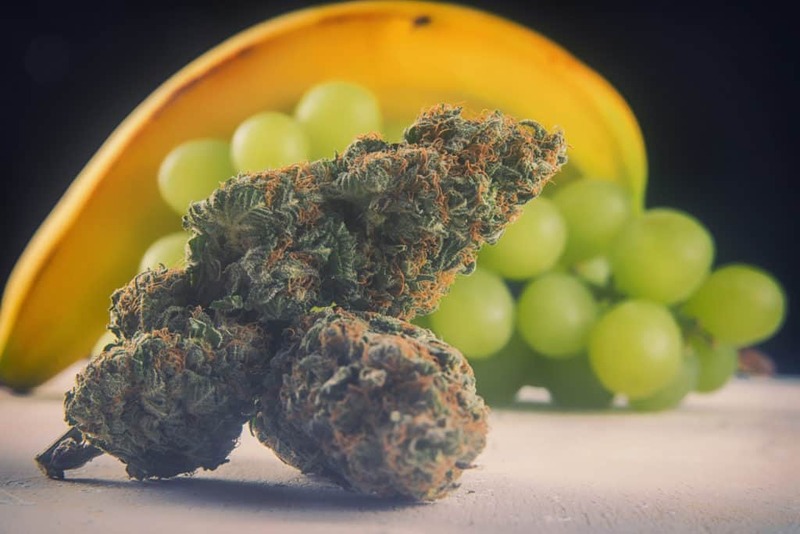 Before jumping into a list of some of the best fruit-flavored strains, let’s consider the similarities cannabis has to wine—as well as the fact that some people are able to enjoy cannabis and wine flavors more than others. In the aroma and flavor department, cannabis flowers rival wine, which isn’t surprising when you consider that both contain plant-derived compounds. Both also are intoxicants, so the similarities extend well beyond flavor and help explain why each has a devoted following of connoisseurs. Because of their complex flavors, both wine and cannabis writers often resort to colorful descriptions and superlatives in their enthusiasm to describe the unique and sometimes-subtle taste that is present. It’s not unusual to see unlikely things like shoe leather and incense used to describe wine varietals or cannabis flowers. Various types of fruit are one of the most common comparisons used for both. But can everyone detect these flavors and enjoy them on the same level? The short answer, unfortunately, is no. Cannabis and wine similarities also extend to the varying extent with which their devotees are able to experience them. It seems clear that some people have a discerning palate for wine and are able to detect intricate flavors others cannot. A similar situation occurs with cannabis flower. If you know enough people who like cannabis, no doubt you’ve heard comments like “It all tastes the same to me,” even when these same people enjoy the effects. Likewise, some wine drinkers enjoy the relaxing qualities of wine, but it all tastes very similar to them. This can be a frustrating conundrum, because clearly some people can’t enjoy the full wine and cannabis experience as well as others. For those who have a discerning cannabis palate, some of the tastiest strains have distinct fruit flavors. Let’s take a short look at 15 of the best, whether they be old industry favorites or strains that are newer on the scene. To help experience the full flavor, vaporizer use is better than smoking. Bursting with grape flavor, Grape Ape was creating by crossing Mendocino Purps, Skunk #1, and an elite Afghani. What results is a hard-hitting indica-dominant hybrid with relaxing effects that make it good for treating anxiety, stress, and pain. Grape Crush (aka Grape Krush) is said to be a prime phenotype of the well-known Blueberry strain but with a decidedly grape, instead of berry, flavor. As an indica-leaning strain, expect a nicely balanced effect that eventually settles into relaxing bliss. A favorite of many for decades, California Orange is known for its sweet citrus flavor. It’s one of the more evenly balanced hybrids, which no doubt contributes to its widespread appeal. There have been a few different versions that are quite similar. The Grapefruit strain is a powerful sativa that hits you between the eyes like a hammer. High-quality genetics went into its creation. A Cinderella 99 (a classic sativa if there ever was one) crossed to a citrusy sativa of unknown genetics served to create a popular sativa with a rapidly growing fan base. As its name implies, expect a bitter citrus flavor and extremely upbeat, socially interactive euphoria. The much-lauded Tangie has created a devoted following in a relatively short amount of time compared to other classics. Its sweet and tangy flavor has a tartness that really does taste like tangerines. Created largely from the Tangerine Dream strain, Tangie is a DNA Genetics strain with soaring sativa effects. If you’re planning a hike or social gathering, Tangie will keep energy levels high and conversations flowing freely. This hybrid leans to the indica side, with skunky dankness and sweet pineapple aroma and flavor. When consumed, Pineapple Chunk results in a balance between deep body relaxation and mental clarity. The genetics behind it include a Dutch strain called Pineapple, as well as Cheese and Skunk #1. The skunky cheese and pineapple is easy to detect with a good cut of Pineapple Chunk. Although this is another pineapple-flavored strain like Pineapple Chunk, it’s a sativa-dominant hybrid instead of indica. This strain quickly gained notoriety and a solid fan base due to the fact that a popular movie with cannabis subject matter was named after it. At 60-percent sativa and 40-percent indica, Pineapple Express has a nice balance that makes it appropriate for either daytime or evening use. Another classic from DNA genetics, Lemon Skunk is a sativa-dominant strain with a particularly apt name. It explodes with pungent lemon and skunky aromas and flavors. Created by crossing an American Skunk #1 with lemon flavor to a Dutch citral, Lemon Skunk continues to enjoy widespread popularity for its flavor and balanced effects. Developed by well-known cannabis cultivator DJ Short in Oregon, Blueberry contains Thai, Afghani, and other strains commonly imported during decades past. The indica genetics shine through, with relaxing but functional effects. Bold blueberry flavors and purple color make this strain a classic. A very popular sativa strain, Strawberry Cough provides powerful medicine with energizing, upbeat qualities that allow clear-headed functionality and enjoyment. The delicious flavors tatste like strawberries and cream. Although it has a catchy name, don’t let the name fool you. Strawberry Cough is no more likely to make you cough as any other good cannabis strain. This upbeat and engaging strain has two unlikely parents: Granddaddy Purple and Durban Poison. As far as effects go, it takes much more after Durban that Granddaddy Purple—which is a hard-hitting indica. Cherry Pie is a great choice for social interaction. The flavors are quite enjoyable, too, with sour berry notes that are reminiscent of cherries. A big hit with indica enthusiasts, Watermelon leans heavily to the indica side with all of the qualities you would associate with a strong indica. The THC level can be quite high, and Watermelon makes good medicine for insomnia and pain relief. As far as flavor profile goes, Watermelon tastes like a sweet and fruity flower that some people believe hints at watermelon. The Mango strain has been around for decades and evolved a bit over the years, although the distinct mango aroma and flavor still remains. This is a balanced hybrid with a combination of sativa and indica qualities. This is not an overwhelmingly potent strain, so it makes a good choice for people who are somewhat new to cannabis. This extremely sweet and fruity strain leans heavily to the indica side of its genetics, but it will not induce a couch-lock state. This is not to say it lacks potency, because it has a good kick to it, but most cannabis enthusiasts find it quite functional. It many ways it acts more like a sativa than an indica. If your looking for a balanced hybrid strain with a fruity taste of the tropics, Papaya might be the strain for you. One of the more notable kush strains, Banana Kush combines Skunk Haze and Ghost OG to result in something altogether new and different. Praised by many for its tropical banana flavors and nicely balanced high, Banana Kush is good for treating depression without being overly sedative. Among the various flavors found in today’s myriad cannabis strains, fruit-flavored strains rank among the best. The range of distinctive fruit flavors is vast and continues to expand as new strains enter the market. There are plenty of options in both the sativa and indica categories, so the next time you want to try something new and different, sample one of the strains listed above. You’ll be glad you did!